Mintel Global New Product Database gives BeneVia's Strength & Energy blend top rating for formulation and positioning. BeneVia was recently rated highly by new product intelligence company Mintel. 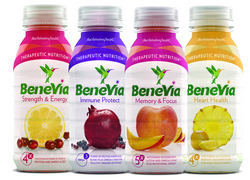 Fruit-based protein beverage BeneVia comes in four varieties that address common health conditions faced by aging consumers. As our retail presence goes national in 2010, we’re confident that we’ll hear even more stories about adults who love BeneVia both for its great taste and its nutritional profile. BeneVia’s “Strength & Energy” blend has received high ratings from one of the world’s leaders in consumer and new product intelligence. Mintel’s Global New Product Database (GNPD) recently reviewed the brand-new therapeutic nutrition drink and gave it a five on a five point scale for both formulation and positioning. Mintel rated BeneVia “Strength & Energy” a four for originality. One of four varieties in the BeneVia® product line, “Strength & Energy” is packed with eight grams of proteins and amino acids that older adults need to build and maintain muscle mass – all with the great taste of cranberry lemonade. The review, available at foodbizdaily.com, acknowledges not only the benefits of BeneVia, but the demand in the marketplace. “With the aging population growing and many seniors taking better care of their health than previous generations, there is a need for more products that speak to the defined needs and increased activity levels of this demographic,” wrote Mintel in its review of BeneVia®. The write-up from Mintel echoes the feedback from the marketplace, according to John Troup, CEO of Little Rock-based HealthSpan Solutions, maker of BeneVia®. BeneVia® is now on shelves and available nationally through online retailers. For more information about product availability, visit http://www.gobenevia.com. BeneVia® is a balanced nutritional juice drink fortified with the essential vitamins and minerals for healthy aging. Clinical research has shown that the proprietary BeneVia® blend of protein and nutrients also improves muscle function and energy levels for daily activity. BeneVia® is a naturally flavored fruit juice drink that tastes better and is less filling than creamy “shake-based” nutritional drinks. BeneVia® is fat free and approximately half the calories of other beverages in the diet, vitamin and adult nutrition categories. For more information about BeneVia®, including nutritional profiles and availability, visit http://www.gobenevia.com. Note to editors: Product photos, samples and peer-reviewed research articles are available upon request.